After an extremely long day of travelling, I arrived in Battembang, Cambodia. 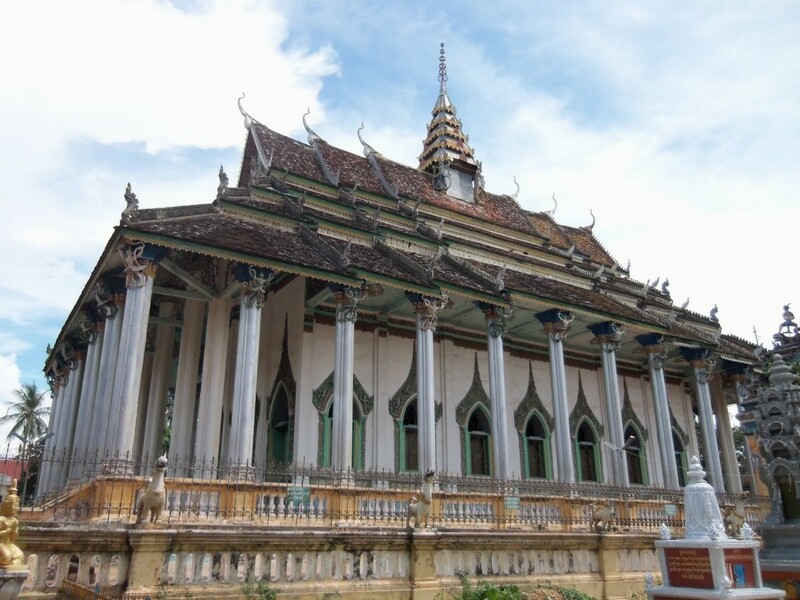 (Pronounced Bat-dam-bang) It is a small city two hours from the border of Poi Pet and is often overlooked by tourists who head straight to Angkor Wat in Siem Reap or the capital, Phnom Penh. On our first day in Battembang, we decided to rent a motorbike and go in search of the ‘Bamboo’ train which was apparently an easy 4km south of the city. The rent the motorbike it only cost us $7 with an added $2 for fuel much better than the $25 to hire a tuk tuk driver to take us to the attractions on the south of the city! 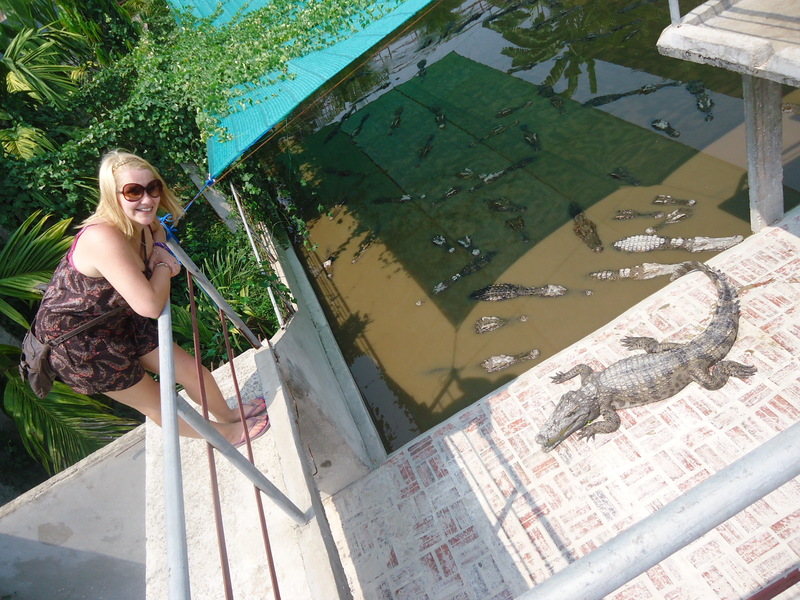 We wanted to visit the crocodile farm (which the tuk tuk would not go to in the same trip). The journey was rather different as the roads are very dusty and gravely not to mention the fact that they drive on the right side of the road here!! Thankfully it was Andy that was driving and not me! As we had to motorbike, we decided to take a first stop at ‘Ek Phnom’ a ruined old temple in the North of the City. It was only $2 each to get in and was our first taste of the Cambodian style temples. The temple was mostly fallen down which we suspected was due to earthquake or just time however we were told that this was destroyed by the Pol Pot regime in the 70’s and the bricks were taken from the temple into the villages and the temple was used as a place to hold prisoners as well. Small barrier only on one side to stop you becoming lunch! We only stayed at the temple for a short time as it is hard to describe just how hot it is here! We set of 2km down the road and came to the crocodile farm. This was slightly strange and disturbing, walking in there was a woman with a toddler and baby just lazing under a shack collecting the entry fee of $1 each. She pointed in the direction of a path with a gate at the end leading up stone steps. The steps took you onto concrete platforms with bunkers on one side and massive pools on the other. 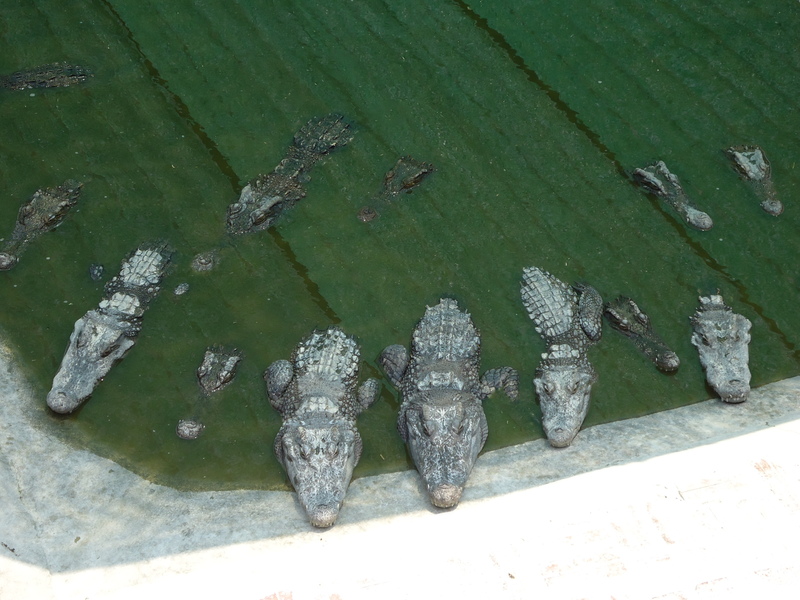 The bunkers and pools contained around 200 crocodiles! One slip and you would have been dinner!! The whole trip was unsupervised with no thought to health and safety what so ever, I am pretty sure even Thailand would have more health and safety to a place than this! We threw a rolled up leaf into the bunker and saw just how quick the crocodile’s reaction was and how when one though there was food all the others came for a nosy! With that, we decided to leave and head out in search for the ‘Bamboo Train’. Two hours later, we were still looking for the railway. The sun was extremely hot with temperatures of around 36 degrees Celsius. We had asked around 15 locals in the space of the two hours where the railway was, pointed on our map, showed the picture but they either didn’t know or point us in the opposite direction of the people we had asked before. We found ourselves stuck as their English was limited, they spoke no Thai and we spoke no Cambodian! 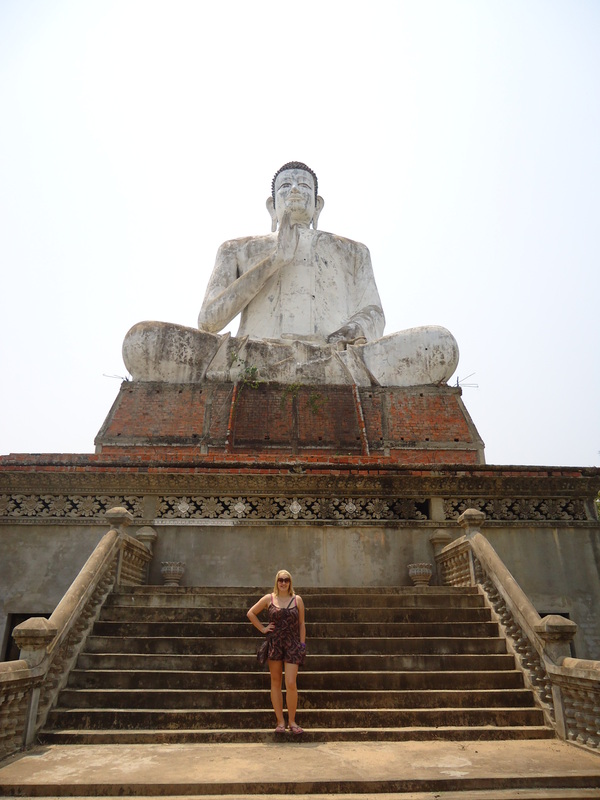 After a year in Thailand where I have grasped how to get around it was a strange and frustrating feeling. We finally decided to stop in front of a hotel and ask there in hope that they would speak some English and decided on just taking a tuk tuk there. The Tuk Tuk’s are much more comfortable than in Thailand with massive cushioned seats which was very welcomed after so long on the motorbike! We agreed with the driver to take us to the temple on the hill, the killing caves, the bats and the bamboo train for $10. We had to travel about 20minutes out of Battembang to reach Phnom Sampov or the temple on the hill and killing caves. We had to pay $2 each to the tourist police to gain entry to the hill and then paid a further $3 each for a guide and motorbike up and down the hill as it was too steep for the tuk tuk. The road up (and down) was terrifying!! It was so steep and the drivers were going so fast I was almost sure they were going to crash! 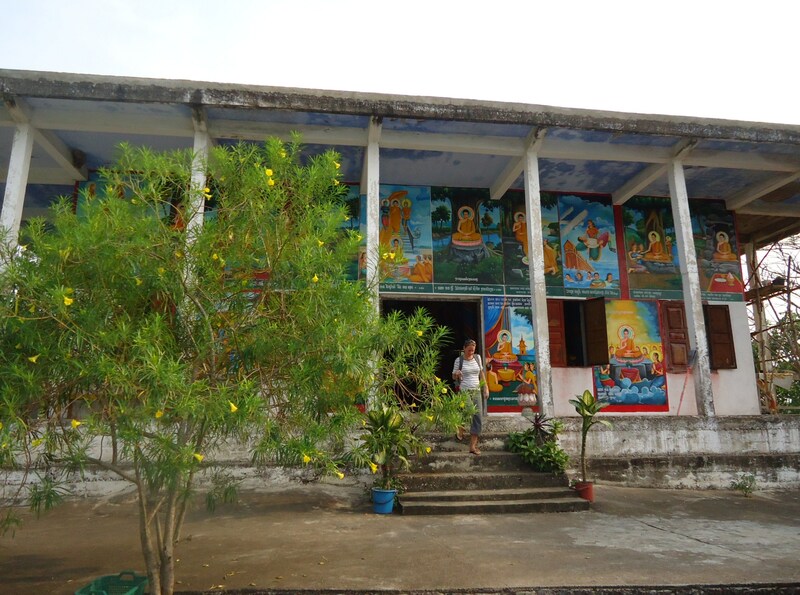 We arrived at a small and beautiful temple which we were told was once used as a storage place for prisoners during the Pol Pot and the Khmer Rouge regime. Looking at it now you would never be able to guess the horror of what had happened only a few short years ago as it looked like any other beautiful temple you come across. The guide then took as down a path to a cave and began to tell the story. During Pol Pots regime in the 70’s people who were thought to be too educated were told to come up the mountain to join a party. In reality they were willingly walking to their own death. They would be held in the temple and tortured before being brought to the top of an opening leading down into the cave. Here they would have their throat slit/shot/beaten or stabbed to death then thrown down the 40meter drop into the cave. 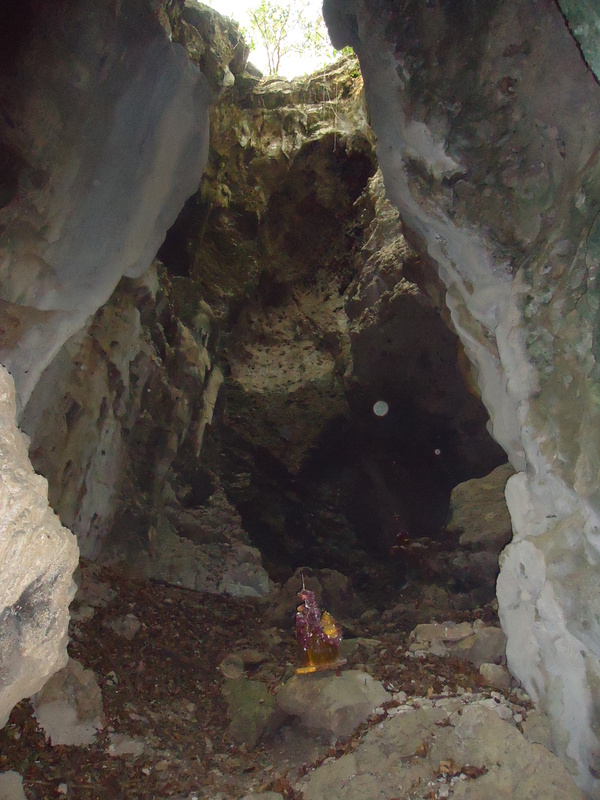 There are two caves, one big one and a smaller one-off to the side that was used for children. 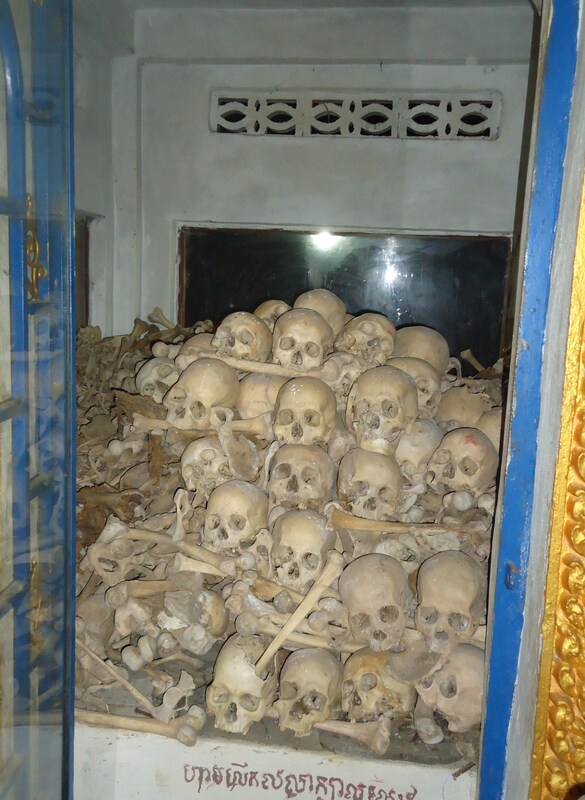 It is thought that 10,000 people died in these caves during the Khmer Rouge Regime. Skulls and bones of the many victims. Walking down the stone steps into the cave you can see how big the drop is from the hole at the top and a shrine full of skulls and other bones of some of the victims. It is truly horrific. Our guide also showed us the markings on some of the skulls which indicated how these people were killed, some their skulls caved in after the 40meter fall, others showed bullet holes whilst some knife wounds. When the caves was discovered after the regime ended, our guide told us that the cave was knee-deep in bodies and bones, most of which have now been removed and buried. The ones that remained were locked away as tourist began to take them as souvenirs. (Why?!) The whole experience was very sad and very eerie. We were then taken up an ever steeper hill on the bike to the temple on the hill. (So steep Andy’s bike lifted its front wheel off the ground and Andy had to jump of and help push the guy up the hill!) Here you can see 360 degree views of Battembang which are beautiful. You can also see old cannon guns left over from the Vietnam war as well as see the monkey’s in the trees which surround the temples. We stayed for 20minutes or so taking in the views and watching the monkey’s before taking the terrifying ride back down the mountain to the bat cave. living in the caves and they come out ever night to feed on insects in the surrounding fields. It’s a never-ending stream and there are so many it sounds like a waterfall! 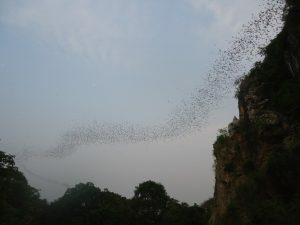 We stayed for around 20minutes and there was no sign that the stream of bats would stop. It was defiantly worth seeing!! It was a very hectic day and we never made it to the bamboo train, as it was the main reason we came to Battembang we decided to go at 6am the next morning. (This time with a tuk tuk driver!!) We paid $5 for the driver to take us there and back and no wonder we couldn’t find it! It was in a completely different location that was stated in the map, down so many small streets with not one sign!! When we got there they were just making up the trains. Which are 2 sets of wheels, and a bed made of bamboo sticks… nothing else! They are not stuck together and lift right up off the tracks, they are mostly used by locals and use the old railway line which is very distorted now and looking down the tracks you could see how bent some of the tracks were, and in some cases they didn’t even meet!! On meeting another train, we had to get off while our train was dissembled, taken off the tracks, and let the other train go past! It was an experience and a half!! The train is so loud and throws you about quite a bit as it jumps over the breaks in the track. It is actually quite scary as it goes at some speed about 30km per hour!! We went for around 15minutes down the track until we came to a small village where a small 14year old boy (with excellent English) showed us around the town and the brick factory, after a 15minute break we got back on the train and headed back to the start. In the distance we could see another train approaching, as there is only one line only one train could go past at a time. 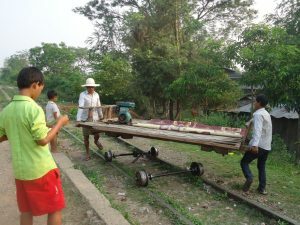 We reached the other train, got told to get off and they literally lifted the bamboo bed off the tracks, picked up the two sets of wheels and moved the other train forward before assembling the train again! Was quite an experience and one definitely worth going to see! Was almost like a roller coaster ride except not quite as safe. Battembang is defiantly off the normal traveler route, however if you get the chance, Battembang is a place I would strongly recommend visiting. The Bamboo Train is unlike anything I have ever experienced and unlikely to experience again!